Ava Parnass MSN CS, AKA “The Kid Whisperer,” is an author, songwriter and child therapist. Ms. Parnass helps parents become Behavior Detectives to investigate hidden feelings, to improve behavior and overeating. As Behavior Detectives parents will learn to Investigate Hungry Feelings not Hungry Tummy, mood issues, tantrums and misbehaving. Ava Parnass MSN Author/Songwriter/Child Therapist “The Kid Whisperer: Marrying up Entertainment & Emotional Literacy for Kids. Read the Book,Dance & Sing the Songs! 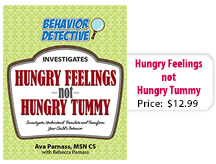 Kids Love & Learn how the “power of feelings” improves behavior & overeating! Parents ,”Prevention NOT Intervention “My Feelings Are Hungry” has a imaginative story kids love,and a Feeling Town Map at the back of the book. Ms Parnass MSN and DR Taffel understand what kids need,love and to be listened to.Listening is something that should come naturally, yet the frenetic pace of today’s world we may not listen to our children the right way. The new techniques featured use pictures and words to help parents and children learn without time-out.Excerpts appeared in Nick Jr.Magazine for 3 consecutive months. This book is a game changer, part parenting field guide and part interactive story book. A book both parents and children will return to again and again. Using this book helps connect on a deeper level. It’s pure relationship magic! Want a calmer, happier child, break the cycle of *tantrums *endless negotiating *defiance *the gimees *, and have more fun.